Amber Fort is one of the very beautiful and attractive tourist place located in Amer, Rajasthan. Fort is located in the town of Amer which is having spread in 4 square kilometer. Amer town is located at a distance of 11 Kilometer from Jaipur, capital city of Rajasthan. The place is famous for its artistic Hindu style elements. The travel time for covering this place is 2-3 hours. The taxis takes 200-250 fare between Amer and Jaipur, for one side. Auto rikshaw takes 250-300 rs for round trip, they waits for 2 hours for their tourists. One side booking can be done at 80-100 rs. Elephant ride takes tourists inside the fort, from ridge to all the way up to the courtyard, main entrance. The story of Amer Fort takes us back to 967 CE, when it was built by Raja Maan Singh. Meenas built the town initially, however it was later ruled by Raja Maan Singh I. Amer Fort is famous for various things, such as light and sound show, elephant ride, its architecture etc. There are various stories which suggests that it Amer Fort is a haunted place, however these are just stories. Maota Lake is the main source of water for Amber Fort, which is touching its boundary. Fort has a series of gates, large rampants and other architectural beauty. It is present just above Hill of Eagles ( Cheel Ka Teela), which is above range of Aravali hills. Jaigarh Fort of Rajasthan is also situated above range of Aravali hills. Both the Forts are connected by underground tunnel, which was an escape route for Royal Family to travel to Jaigarh Fort in case of war. Amber Ka Kila is visited by thousands of visitors every day, the figure reaches somewhere near 5000. It has a high amount of 1.4 Million visitors in 2007. Amber Fort was declared as UNESCO World Heritage Site in 2013, as part of Hill Forts of Rajasthan. Amer was named after Amba, the Mother Goddess. 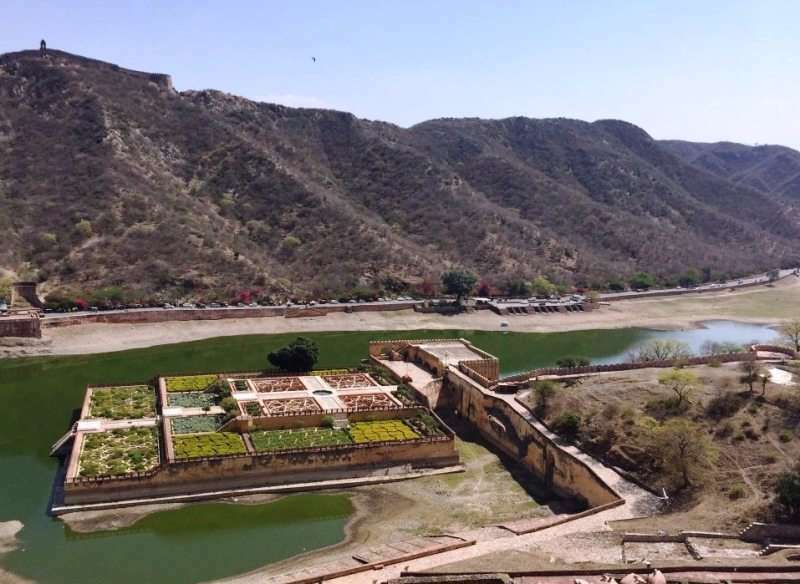 It was a place built by Meenas and Raja Maan Singh built Amer Fort during 967 CE. It was earlier the main structure which was expanded by his successors, Jai Singh I, and by others for the next 150 years. After that, they shifted their capital to Jaipur, the current capital of Rajasthan. Kachwahas decided to move to the pink city, naming it their capital in 1727, it was the time of Sawai Jai Singh II. Amer Fort has been linked with many stories of history of Meenas and Kachwaha Rajputs, as it is a very old fort. The Amber Kila or Amber Qila was earlier built by Meenas and they lived here for a long time. Then, the Kachwaha Rajputs attacked the Meenas when they were performing their Diwali rituals, when they stays weaponless. After which, Kachwaha Rajputs conquered this place and lived here between 1037 and 1727 AD. This adds up to a very vast history of Amer Fort. Amer Fort is opening time is 8 AM and closing time is 6 PM. Amber Fort timing stays same throughout the year. The fort authorities also conducts lights and sounds show, and the Amber Fort light and sound timings are 7 PM to 9 PM. It is a magnificent show which is an eye candy for tourists. The elephant ride of Amber Fort is available from 7:30 in the morning and it is available until 12:30 in the afternoon. Amer Fort entry fee for Indian Nationals at 25 rs per person. Amber Fort entry charges for Indian students is 10 rs per head. However, the foreign Nationals has to pay something extra, 550 rs per person. Entry ticket cost for foreign students is 100 rs per head. Elephant ride ticket cost is 1100 rs for Single or for couple. The camera is allowed in Amber Fort with no additional camera charge. The Amber fort light show depicts the history of the Jaipur and the fort. It takes place every evening and show can be seen in both english and hindi. The show runtime is 50 minutes where it covers various sovereigns and historical incidents etc. The English language light show ticket price is 200 rs and Amber Fort light show in Hindi is priced at rs 100. This show gives you a closer look of the history of city and fort. The amber fort is a must visit place for tourists visiting Jaipur, as it is a very close place to Jaipur. The place is well connected to Jaipur and it is a major tourist attraction. One will get a deeper look into the rich history of Rajasthan. Various facilities are also available within this fort. It is well maintained place with various basic facilities such as toilets, drinking water etc.